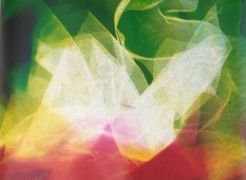 Yancey Richardson Gallery is pleased to present The Sun Room, the fifth solo exhibition by artist Bryan Graf. In his latest work, Graf ventures deeper into his exploration and interpretation of place through experimental, process-driven photographs. As with several of Graf’s earlier series - Wildlife Analysis, Field Recordings and Broken Lattice, location and landscape play a central role in his work. In The Sun Room, Graf has created site responsive recordings of his experiences in the compromised natural landscapes of the Los Angeles River, New Jersey’s Dismal Swamp and his own studio setting in central New Jersey. The “sun room” describes the greenhouse-like structure that serves both as the artist’s studio, as well as a winter garden for plants and seedlings. In Sun Room – Canopy Debris II and III and in the Field Recording (Sun Room) II and III, visual and physical traces of the room find their way into the photographs – the changing light, the winding canopy of wisteria vines, the repetitious geometry of latticework and the layering of deteriorating window screen mesh. The “sun room” informs Graf’s practice, with the resulting works coalescing into a visual journal of his studio practice. For Graf, the term “sun room” also refers to the camera: I’ve come to see the camera as a sun room itself, a dark chamber that facilitates the generation of an image through the collection of light. The works in this show all originate in a garden; a cultivation of ongoing works not limited to themselves, but a procession of generative images, growing out of necessity. 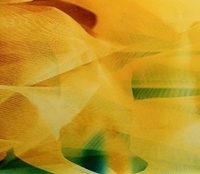 Continuing his exploration of large-scale photograms made with a handheld flash and colored gels, Graf integrates his own gestural activity into the work through the arrangement of manmade and organic materials gathered on site. In Chromatic Aqueduct, fabric sourced from a nearby Los Angeles warehouse forms a textured barrier atop a hypnotic image of the LA River, itself the receptacle of the city’s discarded debris. Likewise, his Field Recordings (Swamp Submersion) photographs incorporate a wallpaper-like pattern based on the symbol for “swamp” used in US Geological Survey Topographical Maps. The repeated symbol serves as a signifier for the Dismal Swamp in New Jersey, while the forms of leaves and branches and the undulating colors create new rhythms of their own. This interplay between the experience of a place, its emotional impact, and the psychological interpretation of that place remains a driving force in Graf’s work. Bryan Graf (b.1982) lives and works in New Jersey. He received an M.F.A. from Yale University in 2008 and a B.F.A. from the Art Institute of Boston in 2005. His solo exhibitions include Moving Across the Interior at the Institute of Contemporary Art in Portland, Maine and Prismatic Tracks, Broken Lattice, and Wildlife Analysis at Yancey Richardson Gallery in New York. 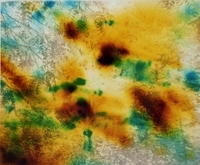 Graf’s work has been featured in numerous group exhibitions including Second Nature: Abstract Photography Then and Now at the DeCordova Sculpture Park and Museum, the 2013 Portland Museum of Art Biennial in Portland, Maine, and The Polaroid Years: Instant Photography and Experimentation, The France Lehman Loeb Art Center, Poughkeepsie, New York. Graf is the subject of three monographs: Wildlife Analysis (Conveyor, 2013), Moving Across the Interior (ICA@MECA, 2014) and Prismatic Tracks (Conveyor, 2014). Graf’s upcoming monograph,The Sun Room, will be published in 2017 by Conveyor.